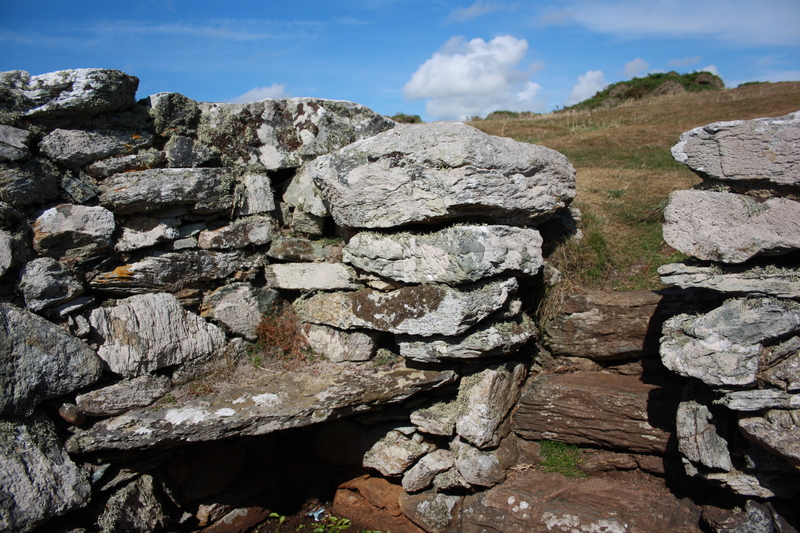 Even though we had excellent directions to find St Gwenfaen’s Well, which is at Rhoscolyn on Holy Island near Holyhead, actually arriving at the well took us slightly by surprise. It was just beside the costal path, in a little hollow, totally unmarked when I was expecting it to be a little further on. The well is located on clifftops overlooking the sea. St Gwenfaen’s is one of the best preserved wells on Anglesey. 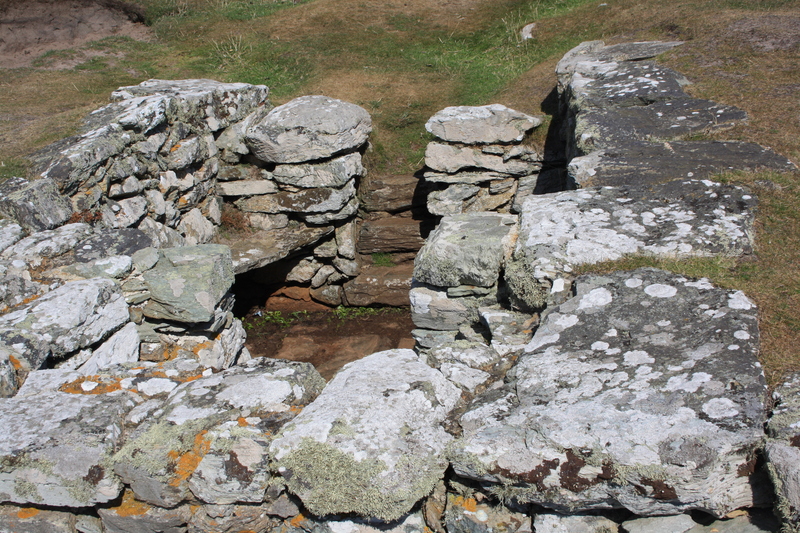 There remains a two room structure, the floor level being around four feet below the surrounding landscape. Within the building there is an antechamber with four stone seats and a samll well chamber. The well into which the spring rises is about three feet square. 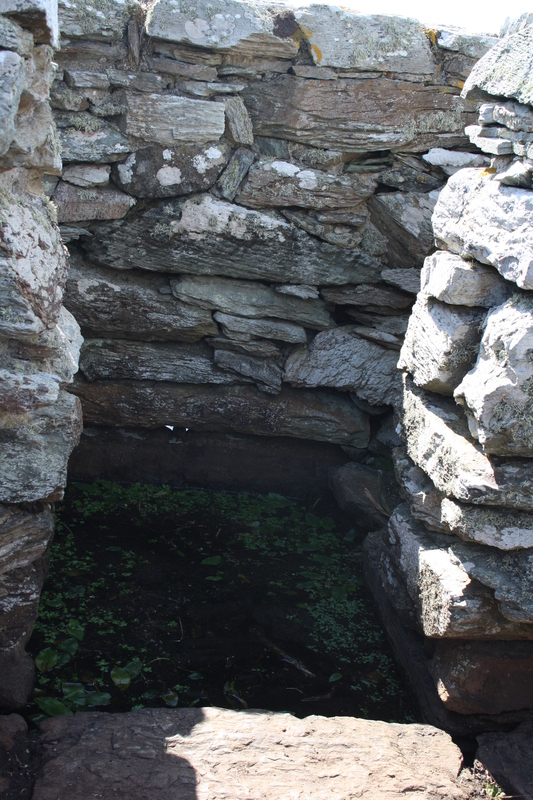 The water flows out from the well into a second pool, outside the building which has steps down to the water to enable bathing. From this pool the water forms a stream which runs down towards the cliff edge. 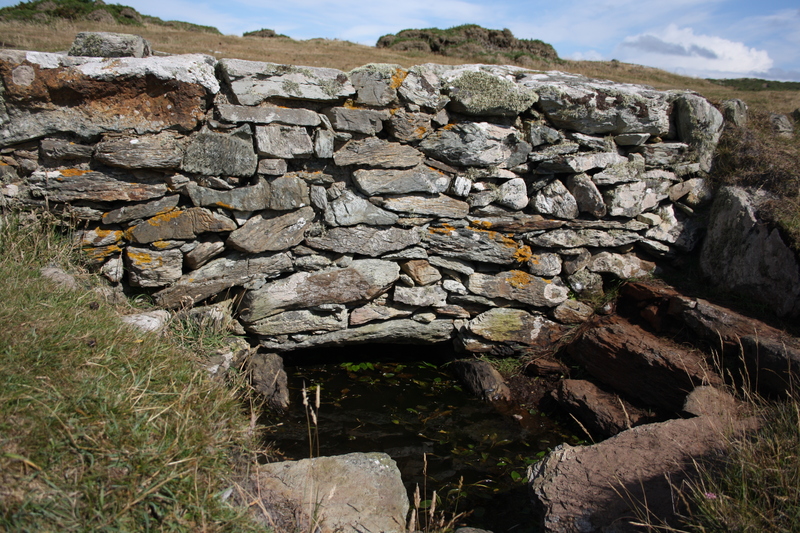 The well is of a drystone construction, built using large grey-whitish coloured stone. 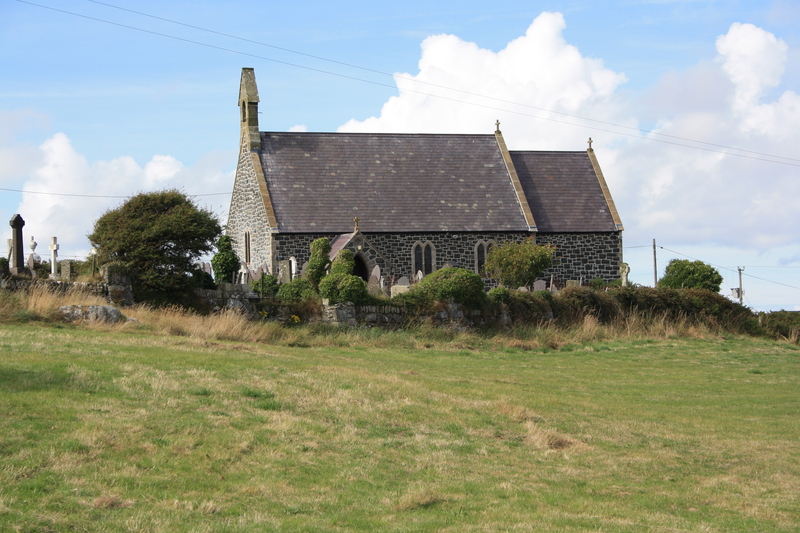 The church of St Gwenfaen, the only church in Wales dedicated to her, is in the village of Rhoscolyn, about half a mile from the well. Rhoscolyn was formerly called Llanwenfaen. Very little is known of the life of Gwenfaen. She was the daughter of Pawl Hen (or Paulinus) of Manaw (which has variously been interpreted as indicating that he was from the Isle of Man or from near the Firth of Forth. He is known to have been a bishop in Wales in the 5th and 6th centuries, having founded a monastery at Whitfield in Carmarthenshire in around 480. He lived to a very old age, hence his nickname Hen (old) . There is a story of his having been cured by St David of an eye inflamation which had cause blindness. 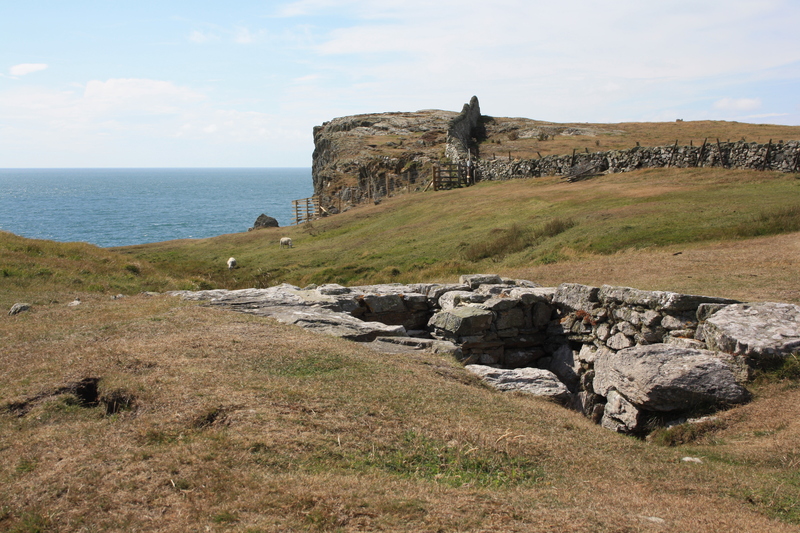 Gwenfaen’s brothers were the Saints Peulan and Gwyngeneu who also had cells in the Holyhead area. It is believed that she founded a cell at a site near to her well. There is no evidence of this, although the first known church dedicated to her in the area dates from 630. Her legend is that she was chased away from her cell by druids, and that she escaped by climbing the rock stack off Rhoscolyn Head. The tide came in and she was carried away by angels. This is how the Saints Bay got its name. The well is traditionally resorted to for the cure of mental disorders, offerings of two white pebbles were thrown into the water by visitors to the well. The existing church dates from around 1870, although it incorporates many features recovered from an earlier 15th century church which was destroyed by fire. Gwenfaen’s feast day is normally given as 4th November, although some accounts have it as the 3rd or the 5th. Having read the instructions to find this well in your “excellent directions” link above, I found this Ordnance Survey map Grid Reference: SH2594975436 on this website – http://www.coflein.gov.uk/en/site/32172/details/ST+GWENFAENS+WELL%3BFFYNNON+WENFAEN/. This is very specific and (together with the written instructions) makes it easy to place exactly where the well is when looking on an O.S. map (1:25000 is best). This places it just inland – EAST – of Porth Gwalch. I used to go on holidays at Rhoscolyn when I was a boy. Thanks so much. The site sounds special. There is power in such places. I attach a poem for you. Marched past this yesterday, didn’t realise! Gutted did not take a photo. Will have to go back!